Satrughna noticed the sense of alarm and anxiety that had overcome his brother; he suggested a few times that a halt could be made for food and drink; but, Bharatha did not heed; he stayed silent. Moreover, they observed a series of bad omens encountering them as they drove along. Crows cawed raucously from positions and directions foreboding evil. Dogs howled piteously, in an eerie tone. These signs of calamity ruffled the calmness which Satrughna had heroically maintained until then. When they arrived at the main gate of the City of Ayodhya, and looked up, the fear was confirmed; for, the festoons of mango leaves had not been renewed for days. Only dried leaves were hanging across the moaning gate way. They were beating against the wind, as if gnashing in anger and sorrow. Why were green leaves not hung across? What had happened to the City? Why this neglect, this sign of distress? The brothers guessed that some terrible bolt of sorrow had fallen on the Capital. They entered the City and drove on. The Royal Stables for horses and elephants were at the very entrance; when Bharatha's eyes fell on them, his heart broke; he lost control over himself. For, he found the animals standing without moving a muscle, heads bent and eyes streaming tears. The mahouts and grooms stood with a heavy load of grief, unable to lift their heads. When they drove further into the City,they found the doors of all the mansions on both sides of the road closed, as if the people inside declined to welcome any one in. The roads themselves were dusty and unswept. The few citizens who were up and moving suddenly turned their gaze away, when they saw the chariot that was coming in. When they recognized Bharatha, they shed tears. The diamond bazaar was closed; so were all shops, all over. Bharatha could not find the tongue to inquire from anyone the reason for the pall of gloom that hung over the City.He was petrified at the unforeseen signs of distress. The chariot entered the Royal Palace. The guards received them silently, with no acclamation of joy, the traditional shouts of Jai, Jai; they stood mute and bent; they could not raise their eyes, for they were tears overflowing. The brothers were now convinced that some unspeakable calamity had overtaken the City; they alighted from the chariot and ran into the palace. Kaikeyi had noted that her son had come; she went forward with great joy to receive him. The bevy of maids who rose with her and walked behind her were groaning in sorrow. Bharatha looked at their faces and stood stunned where he stood, unable to speak even a single word. But, Kaikeyi started to speak. She said, "Son! Is your uncle well?" Bharatha gave some indistinct reply to that question and pressed forward with his own query, "How is father? How is my eldest brother? How is my other brother? How are my aunts, the queens?" At this, Kaikeyi was rendered mute. Tears gathered in the eyes of the maids who stood around. He realized that some terrible news was being hidden from him; he asked, "Mother! Where is father? At this, the maids burst into sobs and tears. Seeing them, Kaikeyi too sensed that she should not delay any longer; she too shed tears and acted the role of a grief-stricken woman. Bharatha could not unravel the mystery unaided; he prayed to his mother to explain to him what had happened to whom, and why every one was so overcome with sorrow. At this, Kaikeyi replied, "Son! What shall I say? I was very happy that with the help of Manthara, I was able to achieve all that I desired; but, with the very first step, my success has broken into bits; the Gods cast an unpropitious eye on it. The Emperor, your dearly beloved father, has left for Heaven". Kaikeyi started sobbing aloud. No sooner did these words fall on his ear, than Bharatha rolled on the ground like a she-elephant at the roar of a lion. He cried out, "Alas, "Father!" as he fell. Like a plantain tree cut asunder, Satrughna too fell flat on the floor. Their agony was indescribable, immeasurable. Bharatha sat up pressing his head with both hands, and wept aloud. He cried out, "Father! We could not be present round your bed when you drew your last breath. O! what great sinners are we? Of the four sons, all the four could not reap the same merit. And this Bharatha and this Satrughna are the worst, the most unfortunate. During the last moments, you would have talked so lovingly to us. You would have given us invaluable blessings and directions for life. Well, we must be grateful that Rama was there with you. You would certainly have told him what you wished to convey to us. Brother! Rise. Come with me. We shall go to Rama and find out what father has left as message for us. Mother! Tell us where Rama is now". Bharatha stood up, ready to go. He was waiting only for his mother's reply. Kaikeyi said, "Son! If Rama were here, your father would not have breathed his last, don't you realize that? Rama is not in the City, don't you know? This was like pouring poison into a wound; Bharatha was shocked by the new blow. Bharatha asked, "Mother! Rama is my very breath. Where has Rama gone?" Bharatha was on the brink of collapse, Kaikeyi replied quick and fast: "Whereto? Do you ask where he has gone? Well. To the forest". "May be", Bharatha intervened, "But, why has Rama who has gone to the forest not returned yet?" Kaikeyi's answer was delivered calmly and with deliberation. She said, "Son! We have no time to relate and listen to that long story. First, busy yourself in arranging for the last obsequies of your father!" From this, Bharatha learnt that his mother was trying to hide some unpleasant secret from him. So, he asked the whereabouts of Sita and Lakshmana, one after the other. The mother replied, "They both have followed Rama into the forest. They will not be returning to this City until after fourteen years. Thus did your father command". Kaikeyi delivered this statement, with a firm, hard voice. Kaikeyi saw that Bharatha was rendered increasingly desperate and distressed by her statements; so, she drew her son near and, stroking his head, she started consoling him saying, "Son! There is no need to lament over your father. He was, while alive, engaging himself continuously in a series of meritorious activities and so, his soul would have attained heaven. Your duty now is to follow the ideal he has set before you, to earn similar fame by meritorious deeds and rule over the Empire happily. Increase his fame and renown by your own wise and merciful rule and maintain the great name of the dynasty." Kaikeyi endeavoured to heal the lacerated heart of her son by these and similar words. But, they struck his heart like a dagger-thrust. Each word hit him like a hammer-stroke. Satrughna developed a burning sensation all over his body, as he listened to her. But, he kept quiet; he did not scream. Bharatha, however, rose suddenly, deciding to discover the truth, for, he felt that his mother was deceiving him by her words, keeping some facts away from him and talking in riddles. He drew Satrughna along and rushed out of the room towards the apartments of Kausalya, the eldest queen and the mother of Rama. And what did he see there! Kausalya was rolling on the floor, in her dust-ridden clothes, lamenting aloud, "O Lord! Lord. Rama, Rama!" Her maids themselves sunk in sorrow, were nursing her into some sort of courage. Bharatha could not restrain himself. Crying out "Mother! Mother!" he collapsed on the floor at her feet. Queen Sumitra too was there, with Kausalya. Both of them recognized Bharatha and Satrughna, and, they suddenly fainted away. Recovering, they clasped each other in a fit of agony and wept aloud; it was a scene that would have melted the hardest stone. The brothers could not bear the weight of sorrow; they fell on the floor. "Mother! Take me to father; tell me the reason why he passed away. Why did my dear brothers, Rama and Lakshmana, proceed to the forest, with Sita? It is all a mystery to me; save me from this agony; tell me why". Bharatha pleaded pitifully, clasping the feet of Kausalya. Kausalya embraced him tenderly and replied, "With your return, my son, I am consoled a little. Seeing you, I can forget the pang of separation from dear Rama. You are as much as Rama to me; I make no distinction". Even while saying so, she interrupted her words, with sobs and groans, and the cry, "Ah! Rama! Can I keep alive for fourteen long years, while you spend them in the forest? Have you resolved that I should be reduced to ashes by the sorrow of separation, just as your father was? Alas how unfortunate am I?" Bharatha suffered even more at these outbursts. His imagination pictured all kinds of tragedies and miseries, for, he was not yet aware of the truth. He prayed: "Mother! Do not keep facts away from me. Trust me. Tell me why Rama went away into the forest, and why father breathed his last; tell me and save me from this tangle of confusion." Kausalya was ever simple and straight-forward and very compassionate by nature. She took Bharatha to be Rama himself returned. She drew Bharatha near her, and wiping her tears off, she said, "Son! Bharatha! Be bold. Do not grieve over the past; such grief is useless. Strange things do happen when times are not propitious and circumstances so conspire. Of what benefit is it to lay the blame on some one? No one should be found fault with. It is my destiny to live on with this load of sorrow. This cannot be avoided; it must be endured by me. But, you are young. You are like the sun at the hour of early dawn. Remember that. "My dearly loved darling, Rama, in obedience to father's order, wore apparels of fiber, tied his matted hair into a topknot, and is now moving about in the jungle. Sita, who cannot live away from him even for a moment, is with him, clothed in a bark-garment. Lakshmana attempted to prevent Rama from going into the forest, but his efforts were of no avail. He declared that Ayodhya without Rama was a jungle for him; he followed Rama. All this happened before my very eyes. O! What a sinful soul should I be that I still live! "I could not go with them, nor would my life depart, when they left; how shall I describe my miserable plight? My heart is really carved out of adamantine stone. 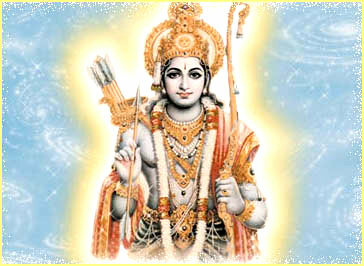 O tender-hearted Rama! You suffer so much now, since you were born of me. Or else, why should you? Alas! Rama! How much suffering you have to endure, living on fruits and roots, and wandering about in the terror-striking recesses of the jungles!" She groaned aloud once and fell in a faint on the floor. Bharatha saw all this and listened to what was told him; but the puzzle still remained unsolved. He was struggling in fear and anxiety, unable to delve into the mystery. Meanwhile, a message was brought by Minister Sumanthra that the royal preceptor, Sage Vasishta, had asked that Bharatha should go to him. Sumanthra too burst into tears when his eyes fell on the brothers. He clasped Bharatha to his breast; the brothers too could not control their grief. Bharatha hoped that Sumanthra at least would throw light on the mystery hanging over the tragic events in the Capital; he tried various means to draw Sumanthra to giving him an account of the happenings; but, Sumanthra did not like to speak on them; he thought Bharatha and Satrughna had already been told what had happened by those whom they had met before his arrival. They went to the Preceptor together. Bharatha and Satrughna fell at the feet of Vasistha and wept aloud. He raised them up, with affection and sympathy, and taught them many a moral and philosophical lesson, in the process of consoling them. "Already, there has been much delay; it is not advisable to delay any further", he said, and directed Bharatha to prepare himself for performing the funeral rites of his father. Bharatha was lost in thought for a long while; then, he pleaded with the Preceptor Vasishta. "Master! This is a duty that has to be carried out by the eldest son, and Rama is the eldest of us four. Now you are proposing that I should carry it out. Is this just? Is this right? You have preserved the body all these days; keep it so for two or three days more. We shall proceed to where Rama is, Satrughna and I, and bring him back with us. Please give us permission to do so." Vasishta replied, "Son! You are a simpleton! Rama would not like to return earlier than the period which has been fixed. He honours the word, when once given. How ever much you might plead, Rama will not enter Ayodhya until the fourteen years are over. Therefore, give up that plan of yours; perform the obsequies of your father and later, you can do whatever you desire." Vasishta spoke in this strain again and again to convince Bharatha of the futility of his idea. Bharatha found that he could not avoid obeying the preceptor. He agreed; the father's body was bathed, and the rites laid down in the Vedas preliminary to cremation were duly gone through. Meanwhile urged by an irrepressible yearning, Bharatha went straight into the apartments of Kausalya and Sumitra, and falling at their feet, he prayed, "Mothers! No. You must desist from immolating yourselves in the funeral pyre of father. If you try to do so, I will not perform the last rites for him." He secured from them the promise that they would not. Both of them were much impressed by his love and affection. They could not but comply with this request. They said, "Son! We shall act in accordance with your desire." Then the body was taken and placed on the pyre of sandalwood piled on the bank of the Sarayu River. Bharatha performed the last rites with scrupulous correctitude, evincing a faith in the Vedas which was a thousand times more than what Vasistha expected and foresaw. He gave away in charity, in the name of his father, the sixteen prescribed articles, in plenty. He gave cows, lands, gold, houses, clothes, food, horses, elephants, coins, and other valuables. The recipients extolled throughout his generosity and filial piety. But the feudatory kings, the scholars and priests, and the common people could not reconcile themselves to the absence of Rama. That sorrow gnawed their hearts. That agony of separation caused pangs of pain every moment. They knew they were helpless; there was no way out. Rama would never give up the plighted word. He would not return, whatever the inducement; he would not come back to Ayodhya until the fourteen-year period was over. They had to accept that fact. So they steeled their hearts to bear with the agony and decided to keep alive, awaiting his return, hoping to rejoice when the term of exile ends. Meanwhile, Vasishta the Royal Preceptor, gathered the feudatory rulers, the vassal kings, the ministers, sages and monks, the wise men of the Empire, and leaders among the people, and held a Conference. First he administered words of advice according to the Dharmasastra, the canons of moral law, on the duties and obligations of rulers. He narrated, in the beginning, the entire series of events from the plot woven by Kaikeyi to the day when Rama left for the forest. Then Vasishta dilated upon the high qualities of the deceased Emperor - his adherence to Truth, his elevated standards of conduct, his high spiritual attainments, his regal splendour, and his loyalty to Vedic injunctions, which made him a generous patron of countless Yajnas, Yagas and other ceremonial rites. Vasishta then went on with the narration of the attempt made by the Emperor to celebrate the Coronation of Rama and the obstacles that came in his way, which resulted in the exile of Rama and the death of the Emperor himself through grief at the separation from his dearly beloved son. Bharatha and Satrughna, who were unaware of these tragic developments at the Capital now being described by their Preceptor, were overwhelmed with anger, as well as sorrow and a sense of shame. They bent their heads; their hearts were filled with contrition. Streams of tears flowed down their cheeks. The persons assembled before them could scarce lift their eyes towards them. Even Vasishta wiped his eyes which were fast filling with tears. The hall was saturated with gloom; a silence fell over the assembly; all men sat like stone images. Bharatha and Satrughna could not any more listen to what Vasishta was narrating; they were too full of anger at Kaikeyi for her nefarious conduct. Bharatha cursed himself that he was born of such a mother; he was so ashamed at this consequence of his own evil deeds in past lives that he could not lift his head or look any one in the face. They were anxious to leave the hall and get away. Vasishta knew what their feelings were; he went near them with comforting counsel. "Son", he said "there is no use lamenting over the past. What has happened has happened. Now, we must think and resolve upon what has to be done. Your father, I must say, was fortunate in all respects. Why grieve over him? Listen to me; bow your head to his command. He has granted you the authority to rule over this Empire. It is right that you accept his grant and honour his order. Your father agreed to be separated from Rama, since he could not bring him self to breaking his own plighted word. He gave up his life, since he had immense love and affection towards Rama. He died in order to redeem his promise; there is no doubt about that. He knew that honouring a promise once made is more valuable than life itself. That is why he was ready to face death itself rather than go back on his word. And, consider, Rama too went into exile in the forest with his wife in order to honour his word! "It is the glory of the Ikshvaku royal line that every one belonging to it would sacrifice anything for the sake of keeping the word once given. That is the splendour which you share. You too must now act according to your fathers word and accept the responsibility of administering the kingdom. May you attain all auspiciousness in the task. May success and prosperity attend on all your undertakings. I have ventured to advise you thus, only because of the affection and compassion I have towards you; or else, I would not have laid on your shoulder this heavy responsibility. I know you can maintain the fair name of your father; you have the administrative ability, the skill, and the courage needed for taking up this burden. Do not hesitate or doubt. Accept the charge." Vasishta patted Bharatha on his back and blessed him. Bharatha took his loving advice and when the Preceptor finished, he rose quickly from his seat, and fell prostrate at his feet. He struggled to speak, for he was in inconsolable grief; his lips were quivering; his throat was unclear. Words could hardly shape themselves on his tongue. He said, "Master! Are these words of yours really an indication of your love and compassion? No, in fact, you have no love, no compassion towards me. For, if you had, you would have never agreed to place all this burden on me. You are sentencing me to this punishment without the least compassion. This Empire that drove the holiest and purest person into the jungles, this Empire that plunged the entire population into years of incessant tears, this Empire that has lost its most righteous ruler, this Empire that has brought eternal infamy to its ruling dynasty, the Ikshvaku Line, this Empire that has brought about the pathetic state of widowhood on mothers Kausalya, Sumitra and the rest, this Empire that has degraded itself in so many ways - you are now entrusting to me! "Alas, this is the consequence of the sins I have committed, the consequence of this unfortunate fellow being born from the womb of that embodiment of cruelty and hatred, Kaikeyi. Instead of inflicting this punishment on me, please earn some spiritual merit by sending me to where Rama is. I can make my life worthwhile and save myself, by engaging in the task of sweeping the paths ahead of them, to make them soft for his feet. I cannot remain in this place a moment longer." Bharatha fell at Vasishta's feet and prayed for permission to leave for the forest. At this, the Ministers of the State rose with folded hands and said, "Lord! It is not proper to continue this state of affairs long; we are having no ruler now. You cannot escape the responsibility which the Preceptor is imposing on you. After Rama returns, you can act in the way you prefer, but now, please accept our prayers. Protect the realm and promote the prosperity of the people. Take up the reins." Bharatha did not reply to their importunities. He wanted instead leave to go to mother Kausalya and see her for a while. Vasishta readily agreed. Bharatha and Satrughna moved out of the Assembly, and made their way straight to the palace of Kausalya. They fell at her feet and Bharatha told her, "Mother! Pray pardon this unlucky Bharatha who has been the cause of all this calamity, having been born from the womb of that wicked woman, Kaikeyi. This cursed fellow is the source of miseries of the realm. Give me permission to leave for the forest. I cannot walk or move about even a moment in this city of Ayodhya with head erect, after my master and lord, Rama has left it on account of me. This Empire belongs as of right to the eldest son; this insignificant fellow has no right over it. I do not need this burden, I shall not bear it. Bless me, so that I can leave immediately". Bharatha stood waiting, filled with grief. Kausalya mustered courage and started to comfort Bharatha. She said, "Bharatha! Consider the circumstances and give up your grief. This is no time for wavering. Rama is out there in the midst of the forest region. Your father is in Heaven. Your mothers, kith and kin, your friends and well-wishers and the subjects are sunk in deep sorrow. All are now looking forward to you as their sole refuge and resort. Realize that all this has happened because the times were not propitious and so deeds of men became crooked and shocking; take courage and decide. Obey the directions of your father. Bow your head to the command of the Guru, Vasishta. Honour the petitions of the people. Act as the ministers are praying you should." Kausalya was holding his hands fondly in hers, while she was trying to persuade him to accept the authority of the monarch of the realm. Her words touched him with a strange softness, as if they were cool sandal paste over a burning heart. They were sweet to the ear, and very appealing to hear. For, Kausalya had no word of condemnation for his mother who had caused this string of disasters; she entertained not even the least doubt regarding his loyalty; Bharatha felt immensely happy and relieved when he listened to her words. He was delighted beyond measure when he noted how broad her heart was and how sincere her affection towards him. He had not calculated even in his wildest dream that Kausalya would treat him like this, when her own son was an exile for fourteen years in the forest, and also pour out such plentiful affection on him, who was the son of another wife of her husband! What a difference, he wondered, between his own mother, Kaikeyi, and Kausalya. He could not gauge it by any unit of measurement. He found in Kausalya the completion and fulfillment of the love that should fill the heart. He folded his palms and importuned, "Mother! Your words filled with tenderness and love are like a shower of cool rosewater on my lacerated heart. Perhaps, you mistook me for Rama! But, alas, I am not that pure-hearted Rama. Bharatha, born of Kaikeyi; I have a crooked nature, inherited from her. I am mean, with no sense of shame. I am the enemy of Rama. You have taken me to be Rama and spoken so kindly, so affectionately. Your heart is so set upon Rama that you address every one as you address Rama himself. I am speaking the truth, mother! Listen to me, and pay heed to my prayer." "Mother! Only those who are established in righteousness deserve to rule. When persons of devious intelligence and shady skills like me rule the realm, the earth will degenerate into an image of the nether regions. Selfish pushers, narrow-minded adventurers, greedy vultures, pomp-loving personalities, self-centered individuals, persons suffering from chronic envy, these do not deserve the right to rule. They harm the interests of the people whom they rule over; they undermine the foundations of righteousness. The kingdom will be ruined by them. Only those who tread the path of virtue and righteous conduct deserve to rule over others. I can discover only one such, and he is Rama. I do not know of any other. Therefore, I shall leave this very instant, and clasping the feet of Rama, pray to him. I shall bring him back with me to Ayodhya. Grant me the permission; bless me without further delay". Bharatha prostrated before Kausalya and waited for the answer. Bharatha's words soothed the heart of Kausalya to a large extent. She said, "Son! In you I find surging forth the self-same feelings my Rama has. Looking upon you, I can bear a little the agony of separation from him. So, if you too proceed to the forest, what is to happen to us? If you declare that your going is inevitable, then, take me too. For whom have I to spend my days within this Ayodhya? Having lost the husband, and having become distant from the son, the wife has not yet dissolved herself in the agony of the loss. Go, secure the permission of the Guru, Vasishta; we shall enter the forest, and spend at least some time with Sita, Rama and Lakshmana. I can then end this life of mine." When she spoke thus Bharatha derived some consolation and peace of mind. Thereupon, Bharatha fell at the feet of Kausalya and Sumitra, and rose to proceed towards the palace of Kaikeyi. Bharatha walked first and Satrughna followed him. They were heavy with grief and resentment that Kaikeyi, putting her trust in Manthara, had brought about such havoc. They tried hard to suppress the anger that rose within them. At last, they entered the palace. They saw at the entrance Manthara herself, elaborately bejeweled, waiting to receive them. Satrughna could not tolerate that sight; he dragged her down by the hair and rained blows on her. She bawled out, 'Ayyo' 'Ayyo' and when the sound reached the ears of Kaikeyi, she ran to the spot, and started rating Satrughna for his action. Taking advantage of the opportunity, Bharatha let him self go, with uncontrolled indignation. He shouted at her, "Fie upon you, blackest sinner! You placed faith in this wicked woman's words and committed despicable sin. How was it that your heart did not break in twain when this woman's disastrous counsel entered it? How could your tongue pronounce those baneful boons? Did it not turn into ashes, when it uttered those abominable desires? With what face can you dare reside in this palace? Aren't you ashamed to move within its precincts? Alas! How did the Emperor place his faith in the words of a person so evil as you are? Blinded by lust, he agreed to barter away the son, in order to win the wife; the conspiracy you hatched was mean and fraught with misery. You polluted the pure heart of the Emperor; you set the Kingdom on fire; you have destroyed the dynasty and its glory; you have brought eternal disgrace on the Royal Line of Raghu; your crooked, poisonous heart has achieved all this ruin. To declare you as my mother is a dire sin. How could you decide that, when you harm another, your son will attain good fortune? Are not the children of others as dear to them as yours are to you? Women who plan ill for other's children are only out the water from the tank. I am unable to decide whether I have to laugh or weep at your banal stupidity." "Instead of fouling these minutes conversing with you, I would rather proceed to the presence of Rama, and pray to him to come back to Ayodhya so that I can return with him. In case, he declines to return, I am determined to stay with him as Lakshmana has done, and be happy serving him. I shall not look on your face again." Saying this, Bharatha turned his back on her, and started with his brother. Kaikeyi ruminated on her erroneous action; she lamented at the turn her plot had taken; she felt that wicked plans by whosoever entertained might grant only temporary happiness. But they are certain to pave the way to ultimate downfall; she found no means of escape; she could not find words to express her remorse and sorrow; so, she stood petrified and dumb. Kaikeyi got disgusted with Manthara. She realized the truth. She felt delighted at the righteous stand taken by Rama. And she hung her head in shame at the recognition of her own sin.